This Pride month, I’m happy to showcase my full support for LGBT people in New Hope and across the country. For too long, too many people have faced harassment and unfair treatment simply because of who they are. And despite increased visibility and understanding about LGBT issues in past years, there are unprecedented attacks in many parts of America today to single out LGBT people — especially our transgender siblings — for harm. Here in Pennsylvania, residents lack explicit protections from discrimination based on sexual orientation and gender identity — meaning that anyone can be fired from their job, refused service at a public place, or denied a home because they are (or are perceived to be) LGBT. This is a gap in our law that must be fixed, especially in light of hostility from the federal government towards the community. In March, the Trump administration rescinded federal guidance issued by the Departments of Justice and Education last year that instructs public schools on how to best support transgender students. As recently as this month, rumors continue to circulate surrounding an anti-LGBT executive order that may be issued anytime. 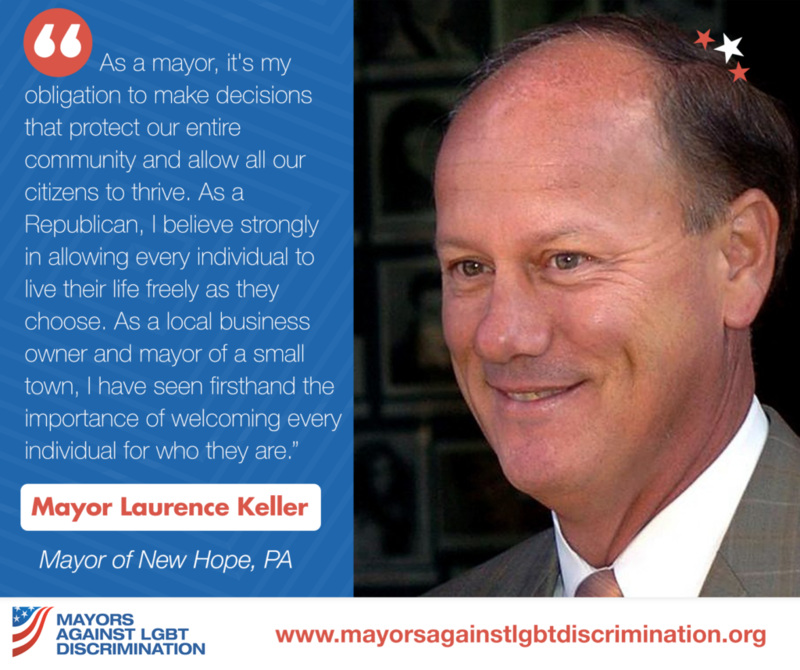 That’s why this week I’m joining Mayors Against LGBT Discrimination, a nonpartisan coalition of hundreds of mayors across the country who are committed to equal protections and fair treatment for all LGBT people. Mayors who are part of the coalition pledge to take action when anti-LGBT legislation is introduced, speak out about their support for equality in the media, and share best internal practices for supporting our LGBT constituents. In a climate where so many feel vulnerable, we must do whatever we can to send a message of acceptance, especially for our youth. As a mayor, it’s my obligation to make decisions that protect our entire community and allow all our citizens to thrive. As a Republican, I believe strongly in allowing every individual to live their life freely as they choose. In my roles as a local business owner and mayor of a small town, I have seen firsthand the importance of welcoming every individual for who they are and creating an environment that thrives on the diversity and talent of every person. Legislation that allows businesses to refuse service to LGBT people on the basis of religion is impermissible. Religious freedom is a constitutional right we all cherish, but it cannot be abused in order to give people the right to discriminate. Businesses that are open to the public must be open to everyone. Similarly, legislation that singles out transgender people for discrimination by preventing them from participating in daily life has no place in Pennsylvania or anywhere in the country. Transgender people are our friends, family, neighbors, and community members. They make valuable contributions to society, and we must be unwavering in our opposition to bills that threaten their safety and well-being. I look forward to continue doing my part to help the LGBT community, and to contribute to an America where no one suffers discrimination or harassment because of who they are. We must live up to our promise of liberty and justice for all, with no exception. Read the piece in The Bucks County Herald.